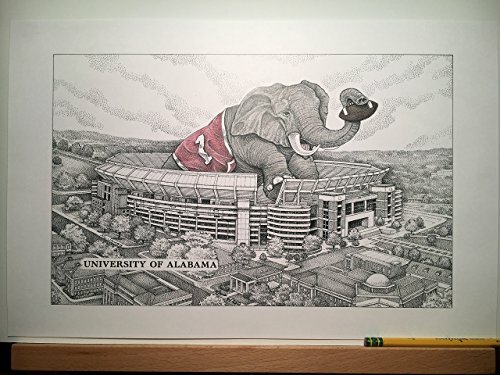 Limited Edition pen and ink print from hand-drawn original of the Alabama football stadium in Tuscaloosa with a larger than life elephant protecting his "turf". The elephant is hand-colored with colored pencils on each print, (so each original may vary slightly from the one shown). This is from a limited-edition series of only 250 prints and is signed and numbered. Your purchase includes print, foam-core backing, and about-the-artist flyer within an acid-free packaging. Fingerprint Tree custom wedding guestbook - Original thumbprint guest book alternative (Small Size Monochrome) includes 1 ink pad! !